The Node.js connection couldn't be more explicit since Node.js can run with Chakra under Windows 10 by using patches Microsoft submitted to the Node project. 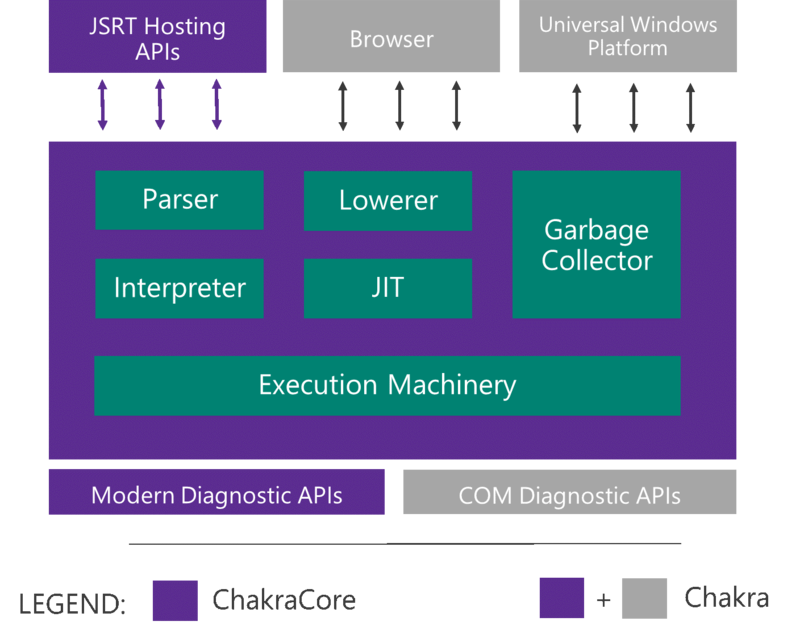 Chakra's open source incarnation, ChakraCore, is a version of the Chakra engine that's been shorn of its dependencies on the Windows platform. For example, the diagnostics APIs in Chakra, which use COM, will be replaced with a new set that is platform agnostic and could be standardized or made interoperable across different implementations. These strategies echo Microsoft's earlier ambitions to create universal platforms. Windows was, and still is, meant to run in a plurality of environments; .Net was and is intended to provide a way to write cross-platform applications. But here Microsoft is only one player among many working on a common platform, rather than one player enforcing a common platform for many.